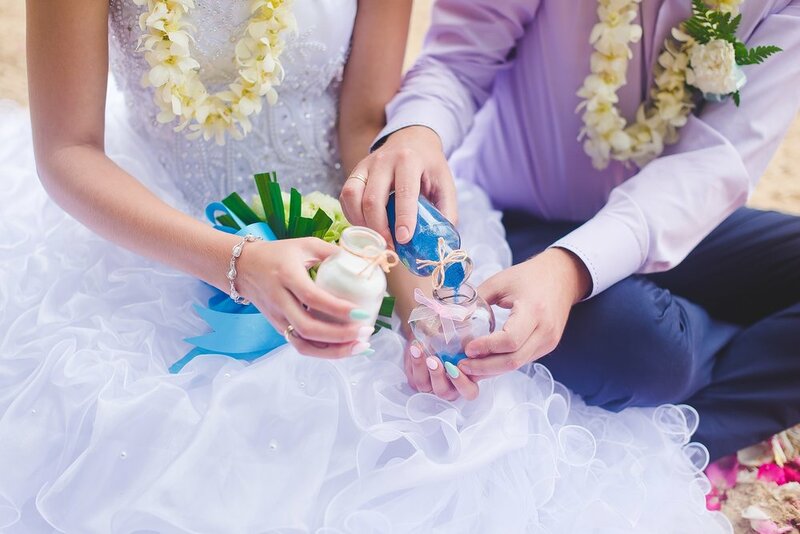 The Sand Ceremony is a beautiful and meaningful addition to vows. Once the marriage license is signed, the couple each takes a vase of sand and pours the sand into larger container. With two different coloured sands, the receptacle symbolizes your two lives blending together. Small pebbles may be placed before sand is poured to symbolize a solid fountain of your marriage. This is also a wonderful enhancement for a Blended Family Ceremony. It allows the children to pour their own sand into the central vase and allows them to feel more involved in the ceremony while taking part in the blending of two families to one. The Unity Candle Ceremony recognizes the light of love that burns at the heart of every family. Using taper candles to light the “unity” candle, recognizes the joining together of lives, families, and loved ones through the marriage. The Unity Candle Ceremony honours the joining of couples and their families. As part of this service, the Bride and Groom may have one or more of their family members, such as their mothers, each light a candle. The couple then use these candles to light the Unity Candle. The Wine Ceremony is a symbolic ceremony representing two persons becoming one in such that the couple drinks from the same cup. The wine of your choice is poured into a carafe and is placed on the signing table to breathe through the ceremony. After the Alberta Marriage License is signed, the ceremony takes place. Get creative if you wish! The cup may be a chalice, goblet or funky wine glass of your choosing. A Love Letter or Wine Box exchange is a romantic ceremony that will enhance your wedding and serve as a lasting reminder of the commitments made to one another. Heart felt letters, encapsulating your thoughts and feelings are locked away to be revealed several years into your marriage. A distinctive way to celebrate your love for one another. Couples may choose to include a bottle of wine/champagne for the big reveal as well as mementoes from the wedding planning and wedding day itself. Here's a ceremony that can involve as many family members as the couple wishes. It would make an ideal enhancement if children are involved! Often red roses are used for their symbolic connection to love. In its simplest form, the couple each have a rose that they exchange as their first gift to each other. Each then places their rose into a vase. To extend the ceremony, family members who have been given a rose come forward and each place their rose into the same vase. All roses could be the same colour or those of the family could be different than those for the couple. While I have referenced roses here, any flower that has special meaning to you could be used. Wedding rings are the strongest and most visible sign of the bond you are about to make as a couple. A commitment to life, to each other and to the future. With a ring warming, the rings will not only be a gift from one to another but will be given with the love, support and wisdom of all present. The rings are passed amongst the family where they each give their blessings upon the rings before being exchanged. A moment of Recognition of Parents is a time to recognize parents of the married couple. It is a moment to thank them for their love and encouragement over the years. The nature of this ceremonial enhancement could include presenting each parent with a flower or small gift at one point during the ceremony. These are just a few ideas that you could include in your ceremony if you are thinking about the possibility of special touches. Should you have ideas you'd like to include, please do not hesitate to let me know! My goal is to shape the wedding ceremony to meet your wishes and create your memories.